Hello HHK readers!! Hope your week started off better than mine did. Of course with the start of steamy weather, the last thing I was hoping for was a kink in our air conditioning. Darn it! Hopefully we can get that figured out before the really, really hot afternoons arrive! 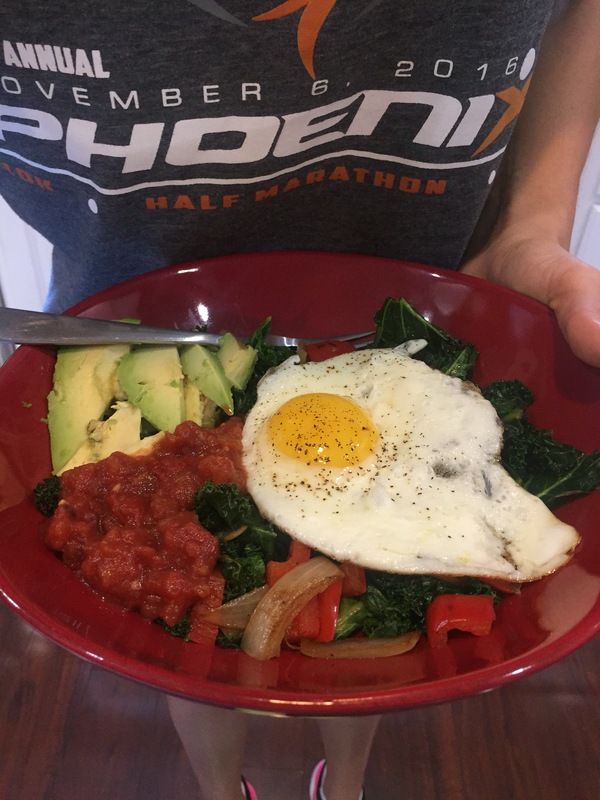 Typically on Tuesday mornings I go for a run and then come back and make myself a special breakfast that takes a little extra love and effort. Tuesdays I go into work a little later, so I try to take advantage of the added time and whip up something special! 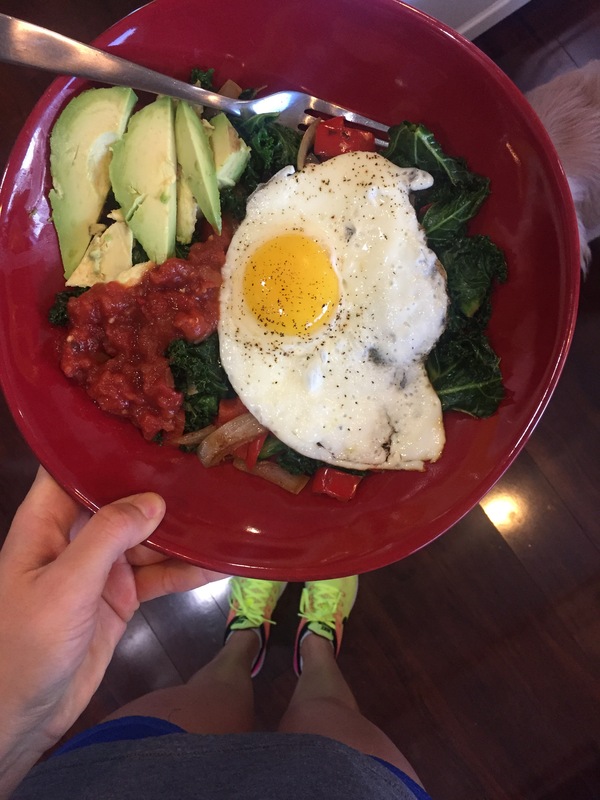 Today I’m going to share my Go Green Breakfast Bowl, which incorporates a healthy serving of vegetables and protein that gets me going for the day and checks off a serving of vegetables before 9 am! While I call this a “green” breakfast bowl, there is a little more color in there than green, but the majority of the bowl consists of kale — hens the name green! I top this delicious bowl with a runny egg that adds a helping of healthy fats, protein, and a variety of vitamins and minerals such as iron and lutein (an antioxidant that helps maintain good eye health!). Let’s talk about eggs for a second. Eggs get such a bad wrap. I often hear people talk about eggs with fear, thinking it will surely effect their cholesterol if they eat eggs for breakfast. Well, as with anything, too much can of course be a bad thing. I would never recommend eating 4-5 eggs daily, but an egg a day in my book is perfectly fine. Eggs are filled with vitamins, minerals, protein, and yes a little saturated fat, but the good outweighs the bad. If you take away the yolk, you will use a lot of the nutritional quality of the food. I tend to mix 1 egg with 1-2 egg whites to bulk up my meal. If you are filling the rest of your diet with fiber and nutrient dense-fruits and vegetables, cholesterol should not be a concern of yours when eating eggs! Now on to that yummy recipe! If you tend to like “breakfast bowls” I would definitely give this one a try! I have also added quinoa to this bowl in the past or a small scoop of black beans. See what you like and as always feel free to reach out with questions or other ideas! In a large saute pan, saute onions and chopped bell pepper in fat of choice for about 3-4 minutes or until slightly soft. Add chopped kale and seasonings; you may need to add a little water to help the kale wilt (I find this helpful). In a separate pan, cook egg + egg white as desired. I enjoy a runny yolk, but you can cook scrambled or however you please for your dish. I tend to just top the egg with a little salt and pepper. Once the veggies are soft and fully cooked, place in a shallow dish. Top with the egg, a few slices of avocado, and 1-2 Tbsp of your favorite salsa. Enjoy! This entry was posted in Breakfast, Recipes and tagged blog, blogger, breakfast, dietitian, eats, food, food share, foodie, healthy, healthy eats, healthy recipes, inspiration, kale, nutrition tips, Recipes. Bookmark the permalink.